Here are your 2018 Candlelighters Christmas Raffle Winners! 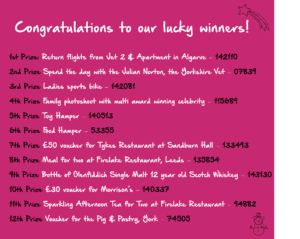 If you are a lucky winner, “CONGRATULATIONS” please give us a call on 0113 322 9283 to arrange to collect your prize!! This year the Candlelighters Christmas raffle will be bigger and better than ever before! This year the STAR PRIZE is a holiday to the Algarve in Portugal which has generously been donated to Candlelighters. 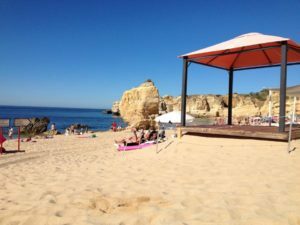 The flights have been donated by Jet2.com and a supporter, who wishes to remain anonymous, has offered the use of his private apartment in the Algarve, Portugal for the lucky winners of the Candlelighters Christmas Raffle 2018. Jet2.com have donated return flights for 2 adults to any Jet2.com European destination, from any Jet2.com UK base, from which Jet2.com flies directly to the destination. This includes Faro airport. 4th prize – Voucher for a family photoshoot with multi award winning celebrity photographer David Charles. This includes an hour studio shoot with a maximum of 8 people and a 10×8 print. To be redeemed by 31st July 2019. Good luck to everyone with a ticket! The apartment has 2 bedrooms and can sleep up to 4 adults (or 2 adults and 3 small children with a travel cot) for up to 7 nights. The holiday is subject to availability, and excludes the months of July and August, as well as peak periods such as school holidays. We advise the winner to book as soon as possible and will put them in contact with the owner once the winning ticket has been drawn on Friday 14th December 2018. The booking of the apartment is subject to a breakages and security deposit of £250 which is refundable upon the apartment being vacated as it was found, and the keys being returned to the owners address here in the UK. There will be no additional extra costs for utility bills, these have been generously included by the owner. Jet2.com has donated return flights for 2 adults to any Jet2.com European destination from any Jet2.com UK base from which Jet2.com flies directly to the destination. Please see www.jet2.com for details on flight times and timetables. Please note some flights do not operate all year round. To take advantage of your prize, flights must be booked before 17/07/2019 and taken by 31/10/2019 subject to availability*. Please refer to the terms and conditions below. Flights are subject to availability and are non-transferable. When the winner of the star prize is drawn we will give full details on how to book the flights. *Terms & Conditions. Flights are subject to availability and may not be taken at peak periods such as Christmas, New Year and Bank/School Holidays: please see www.jet2.com/promotions for further terms and restrictions. A restricted number of free seats are available per flight, Jet2.com reserve the right to offer an alternative date/destination to the one offered if this allocation is met. Flights must be booked by and taken by dates as specified in the competition terms and conditions or by Jet2.com. Changes to names and travel dates are subject to the standard change fee plus any difference in fare as outlined in Jet2.com’s general terms and conditions of carriage, which can be found at www.jet2.com. Flights may be changed or cancelled by the airline for administrative reasons without prior notice. In accordance with our terms and conditions, Jet2.com’s schedules are not guaranteed. Any changes will be notified via email. [One item of checked baggage is included per person. Flights may not be exchanged for cash and may only be taken by the competition winner along with [one] other traveller. Flights must be taken at the same time and are non-transferable. Jet2.com recommends that you take out your own insurance as this is not included in this prize. You must have a valid email address to claim this prize. Excludes New York. This prize has kindly been donated by Julian Norton, in support of Candlelighters. The prize applies to one winner only, who must be over 16 years old. This is due to constraints of the premises and space the car if the day involves going out on visits. As Julian’s days are unpredictable it may be necessary for the winner to spend some time with his colleagues if the duties Julian has to undertake are unsuitable. Once the winner has been drawn we will arrange a suitable day when Julian is available to spend a day with him as a vet.